Hello all, Emily here. I did something big, time consuming and somewhat difficult. But I did it! 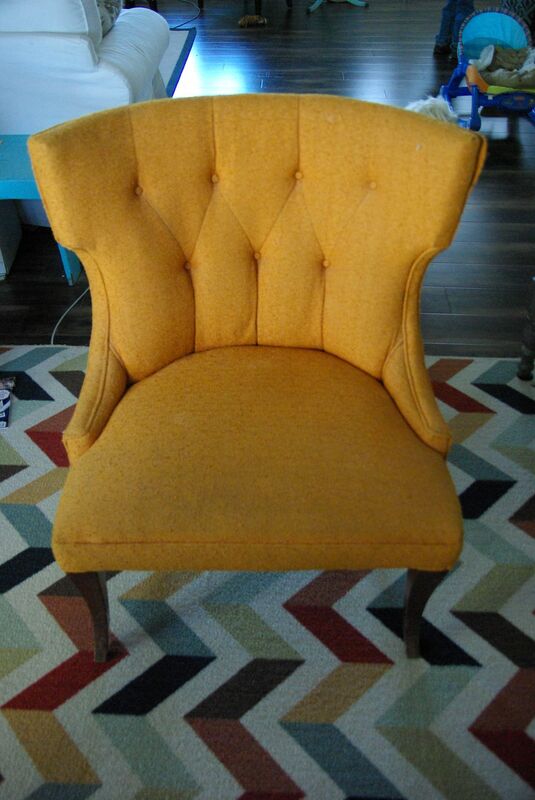 I have been wanting to reupholster a chair for a while. 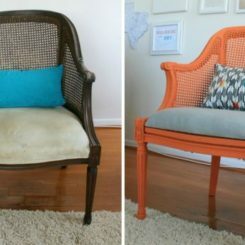 I have dabbled in redoing chairs, but they were simple cushion redo’s. 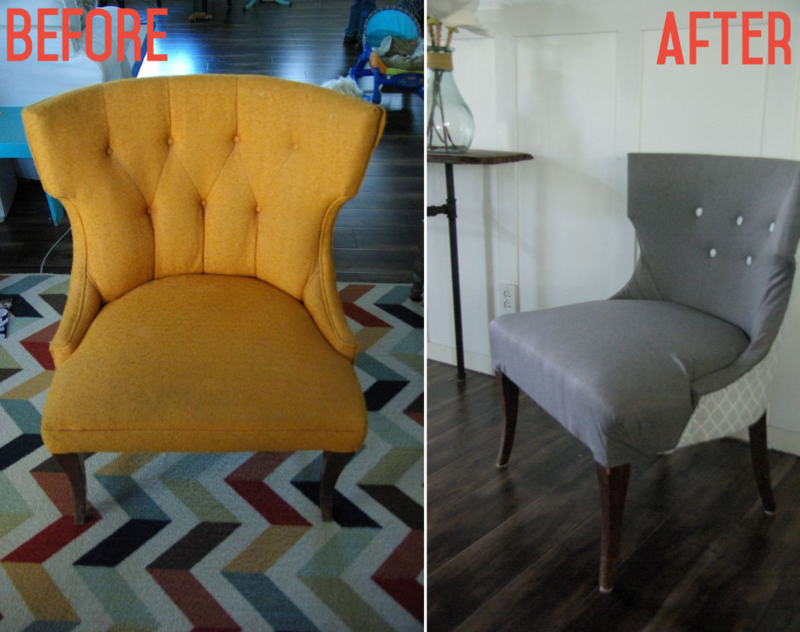 However, this time I tackled the full, big time, full reupholster. 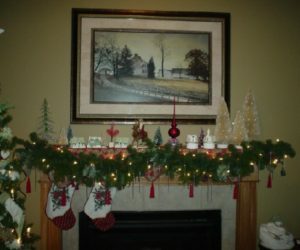 I also challenged myself and did this with absolutely no sewing! There is not too many examples of this on the internet, so it was a lot of trial and error for me. 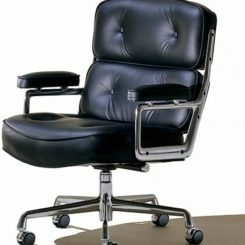 I purchased this chair from a second hand store. It was outdated and had a horrible color. But, I liked the bones of the chair. 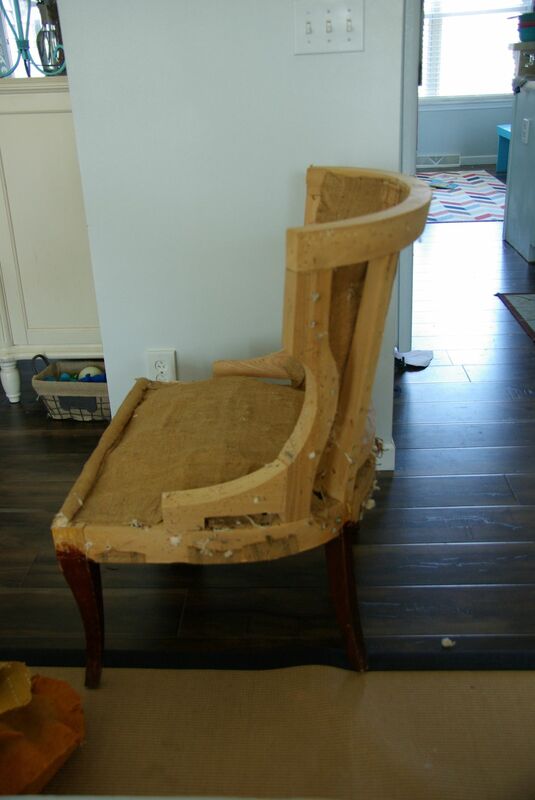 The first step in reupholstering this chair is taking it apart. 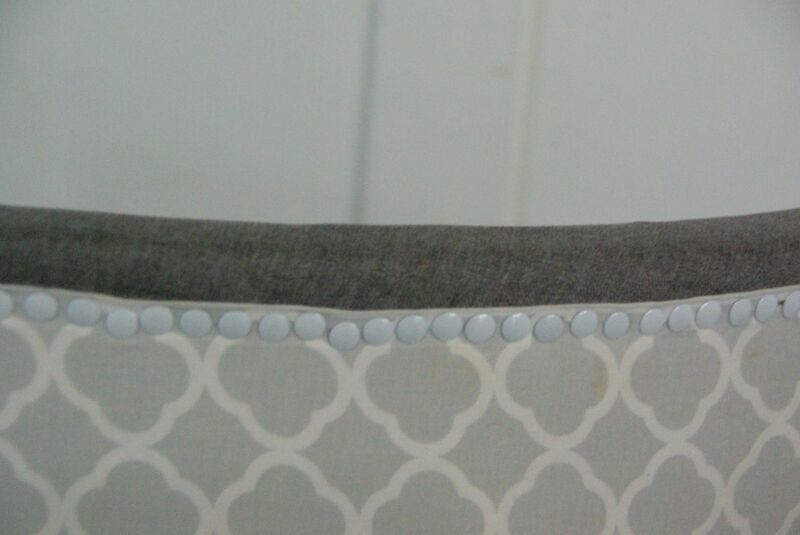 I did not know what kind of shape the cushions under the material were in. Once all apart I would be able to see how much needed to be replaced. Once I had the chair apart I realized all of it needed to be replaced. I did not even take pictures of it. The cushions had a odor to it and I just wanted them off and out of my house. 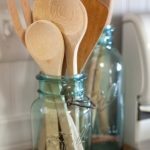 So everything was stripped but the wood and the springs. I did save the material that was on top to use as a template if needed for the new material. 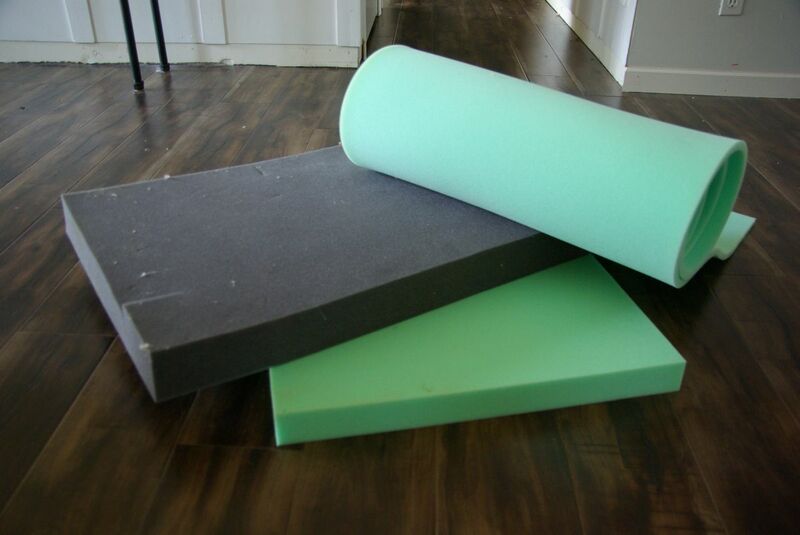 I purchased a lot of foam. I purchased two large squares that are 3 inch thick foam. Two yards of 1/2 inch foam, and one package of quilting cotton batting. 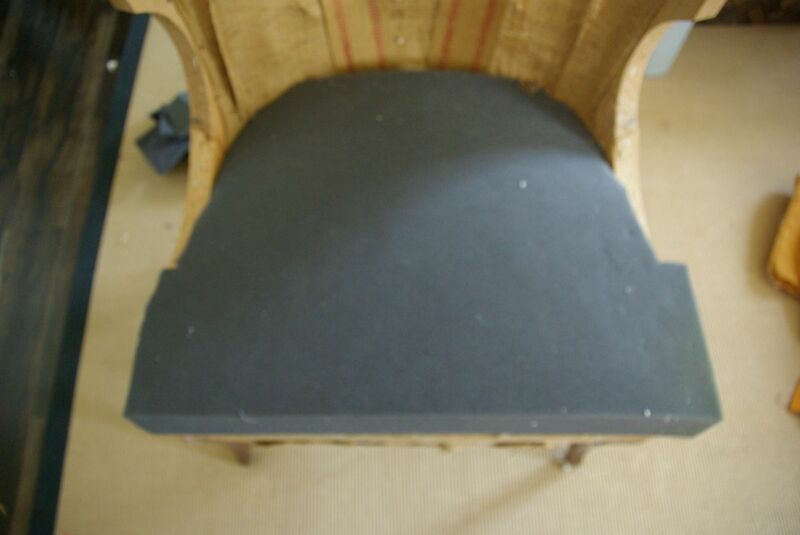 The first step in this reupholster job was to get the seat cushion done. 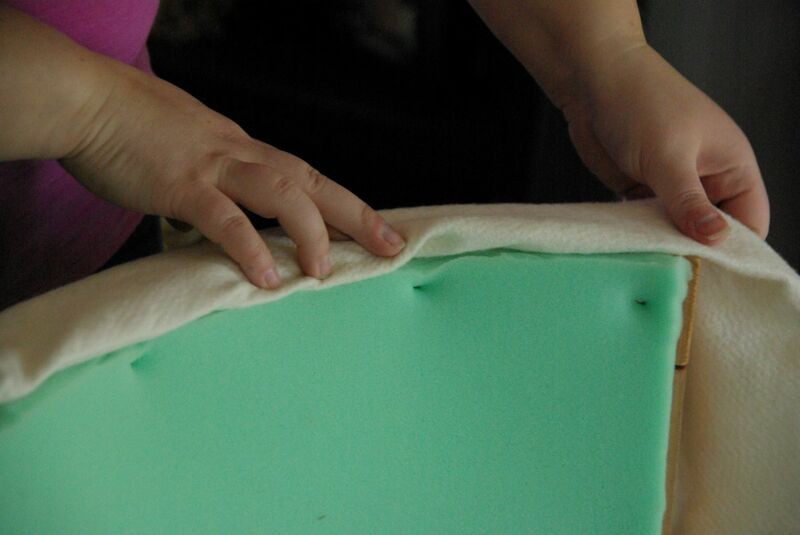 Setting the large square foam on the seat and marking it to the size of the seat. I cute the cushion down to size using a razor blade. I used the seat template from the old material to make sure I was not cutting too much. If I needed to revise and cut more that would have been better than too little. I cut the seat cushion, and made sure it fit snugly. Once I had the seat cushion fitted appropriately. 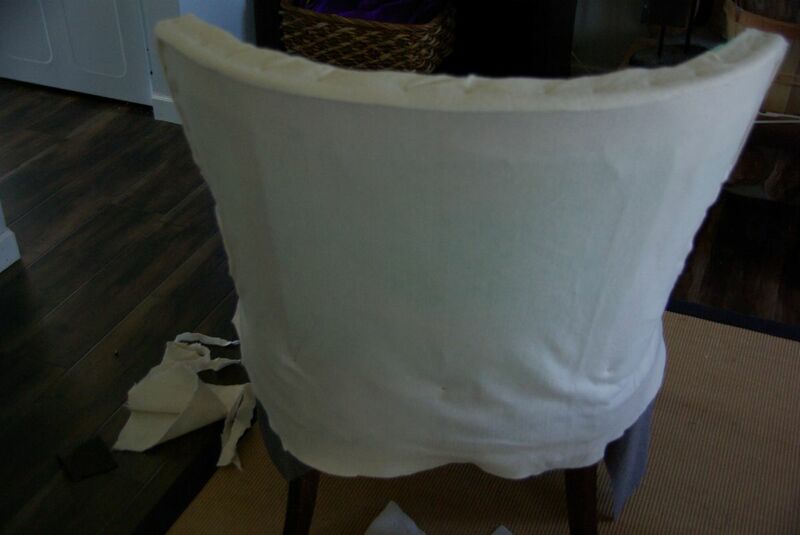 Before I started adding any fabric I needed to add the cushion to the sides of the chair. 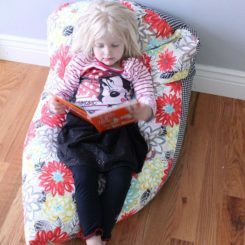 I am using the thinner cotton quilt batting to cushion the sides, arms and to cover the cushions and bring them all together. This way any lines or dips in the cushions will be covered and hidden by the batting. 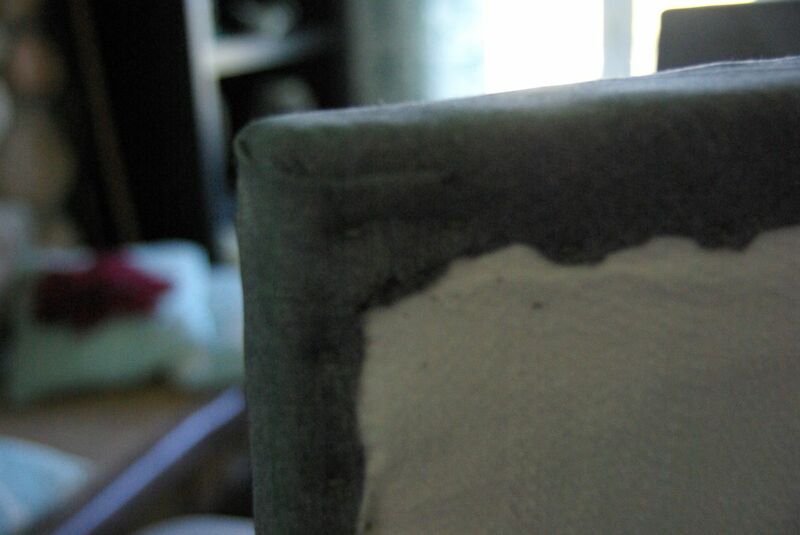 I folded the batting in on the front of the chair. I used a standard air stapler. 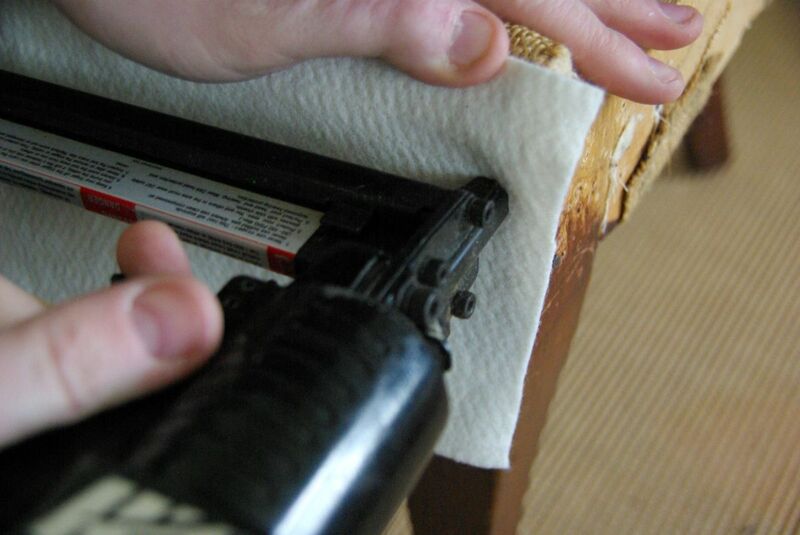 It has enough power to push the staple through the fabric and into the wood of the chair. I needed to cover it with the new material. 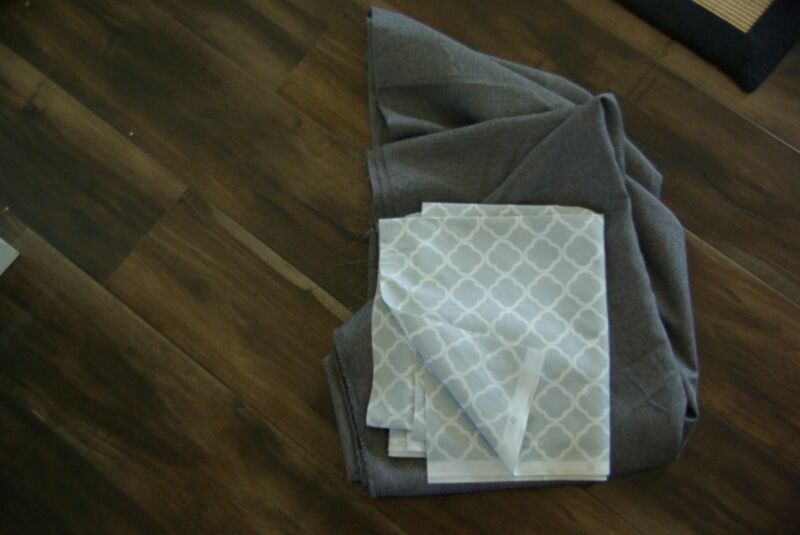 I purchased a dark gray cotton material, 3 yards worth. 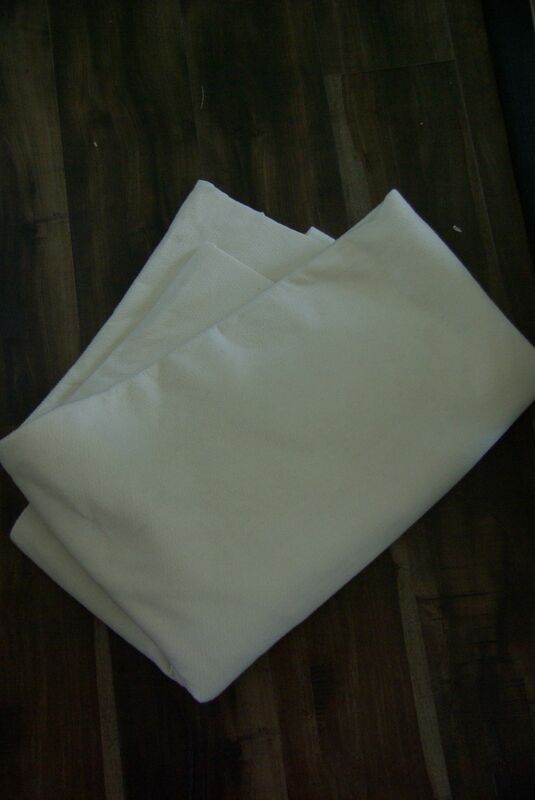 It is a durable, heavy and thick fabric. This will make it be less likely to get ripped. 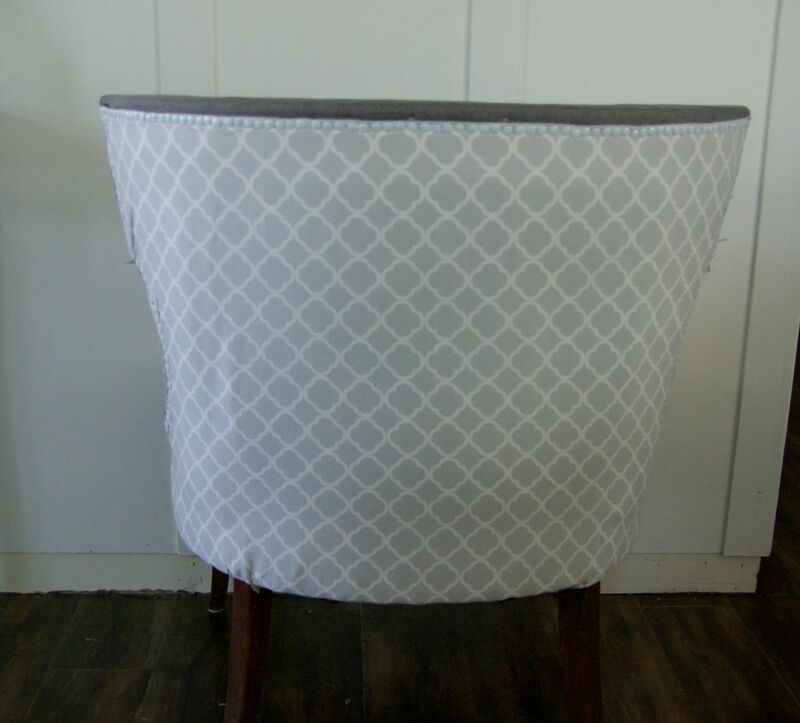 I also purchased a light gray with a pattern to go on the back of the chair. I purchased 2 yards of that fabric. 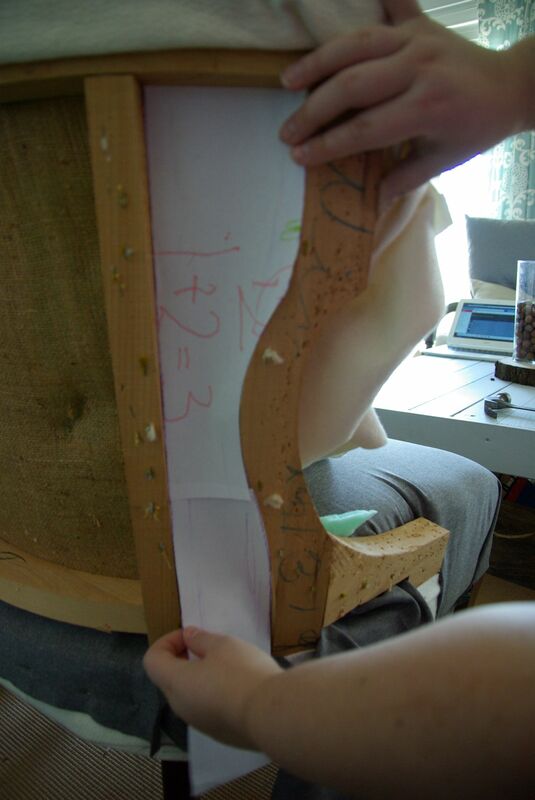 The first step for this was to use the seat template from the original fabric to measure where the new fabric should be cut. 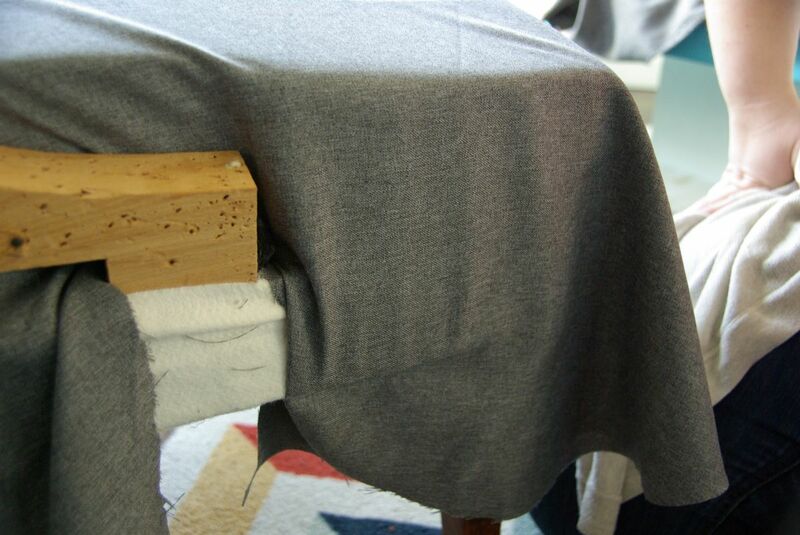 When it was cut, I cut slits in the fabric where the chair has a break in the wood backing. 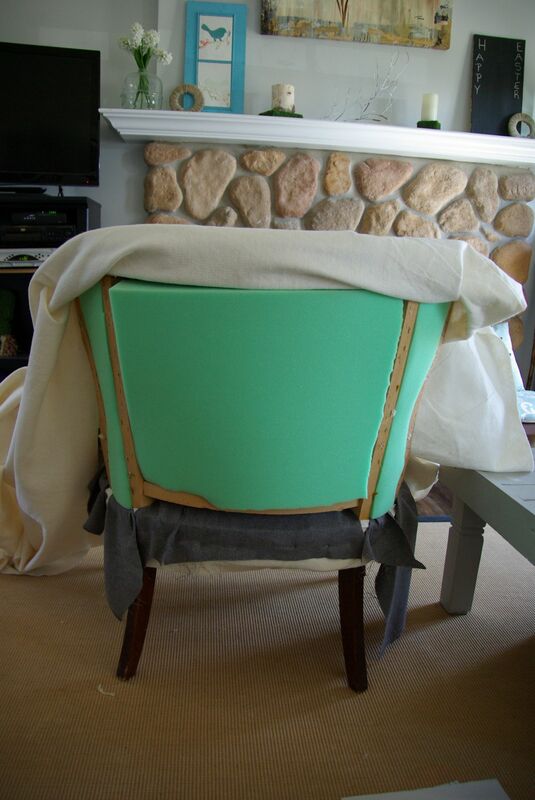 Then slipped the fabric through the back of the chair. 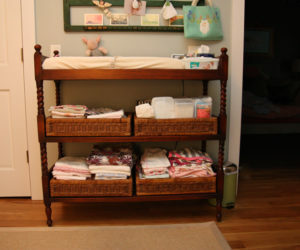 This will help in keeping the fabric tight on the chair. 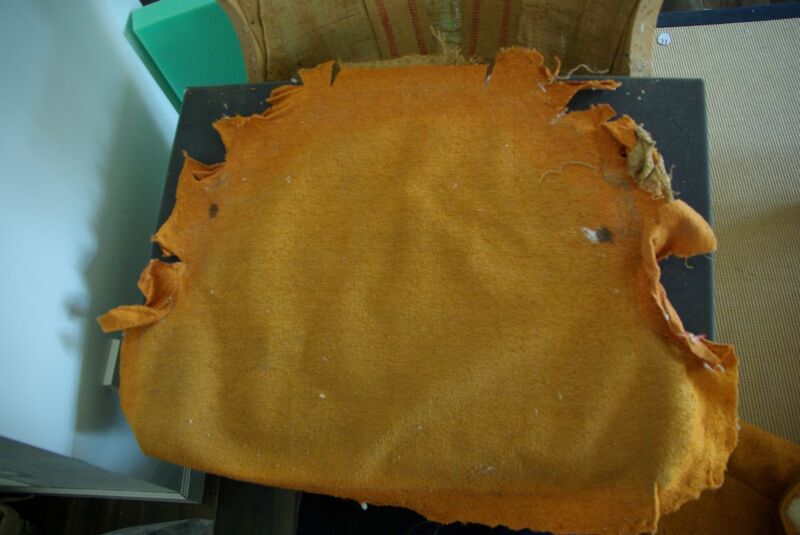 If this was a normal chair reupholster I would have sewn the material around the cushion. 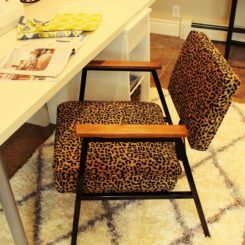 However, since this is a challenge to do this chair with no sewing the plan of action is to keep things as nice and tight as possible. 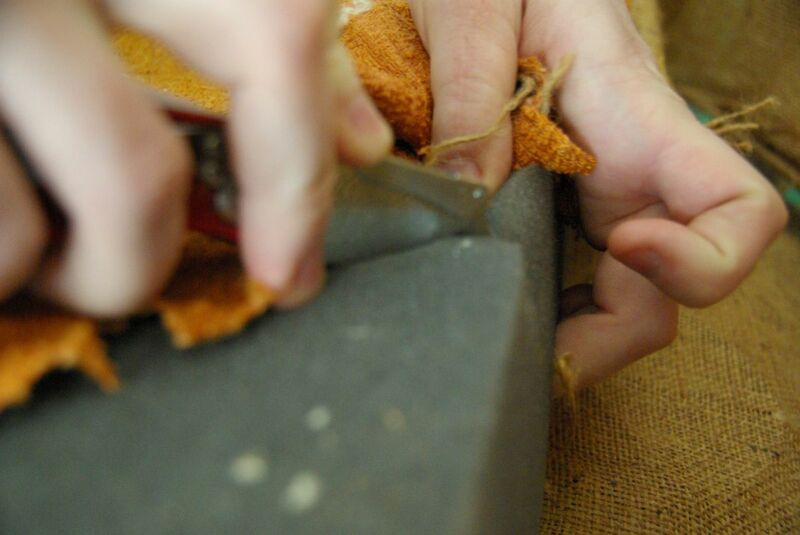 Making sure the material is pulled tight, almost squishing the cushion is the best way to make sure all stays secure and in place. 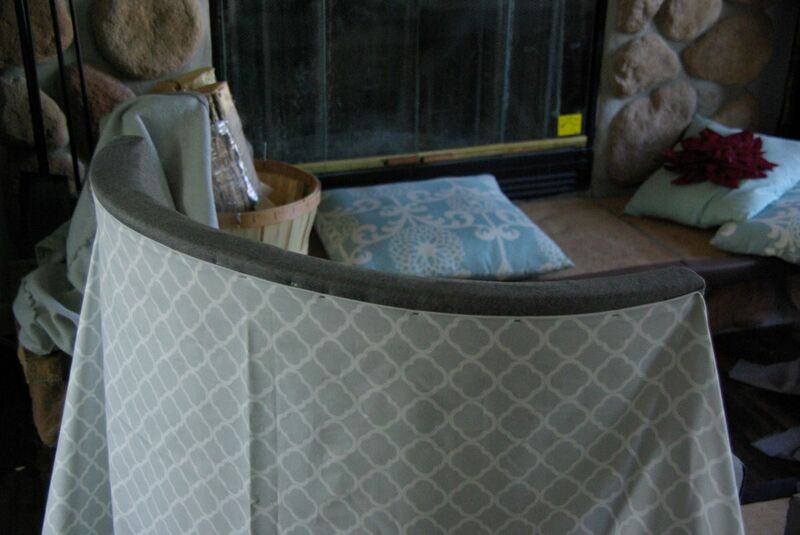 I wrapped the front of the fabric around the seat cushion and the bottom of the chair. 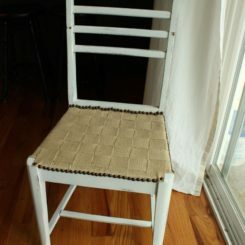 I then pushed the fabric under the chair and stapled it down. 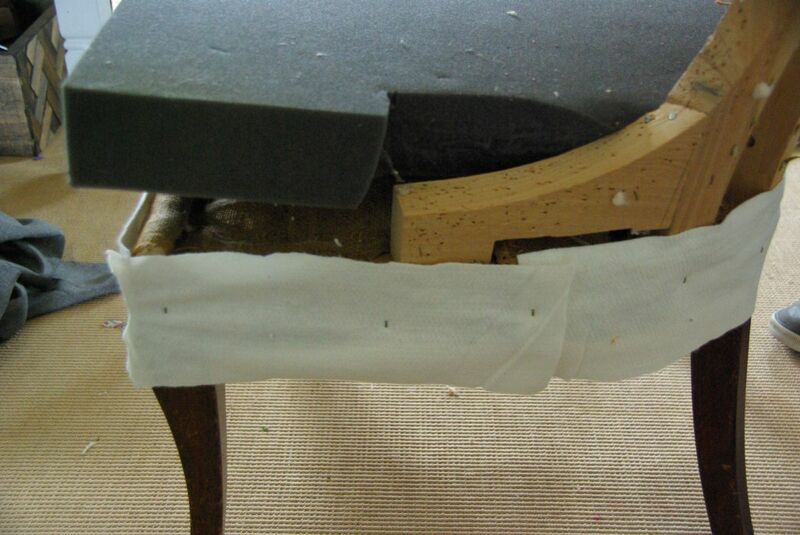 I pulled the back of the fabric of the seat cushion very tightly and stapled that as well. 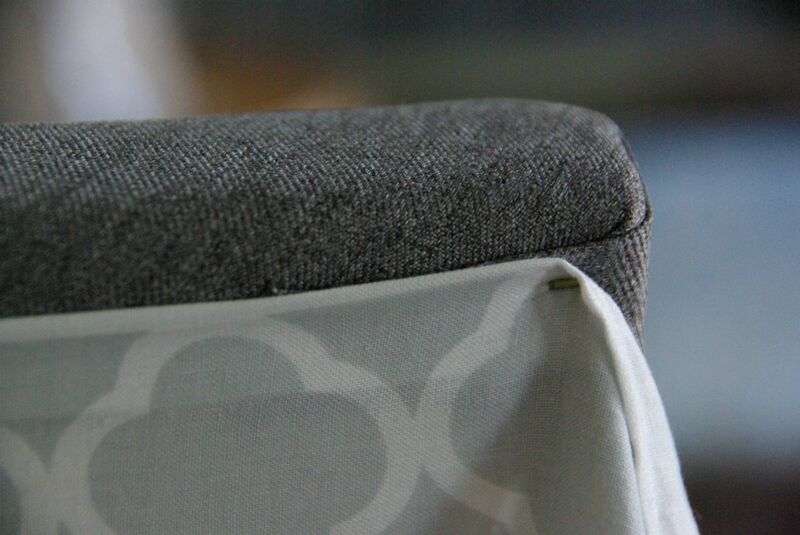 Once I had the fabric stapled to the seat cushion I needed to make it look neat and tidy. The corners were a little bit of a issue. 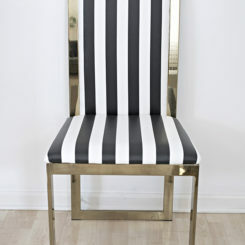 I decided the best way to make them look as good as possible was to make a diagonal fold on either side of the chair. Pulling tightly so that there is no give when anyone sits down. 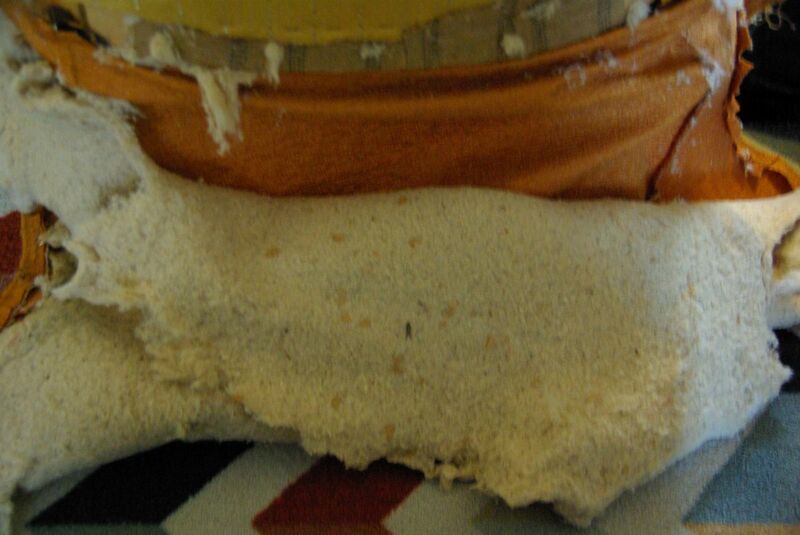 The cushion was done and secure, because of the securing of the cushion and the fabric to the front and the underside of the chair. 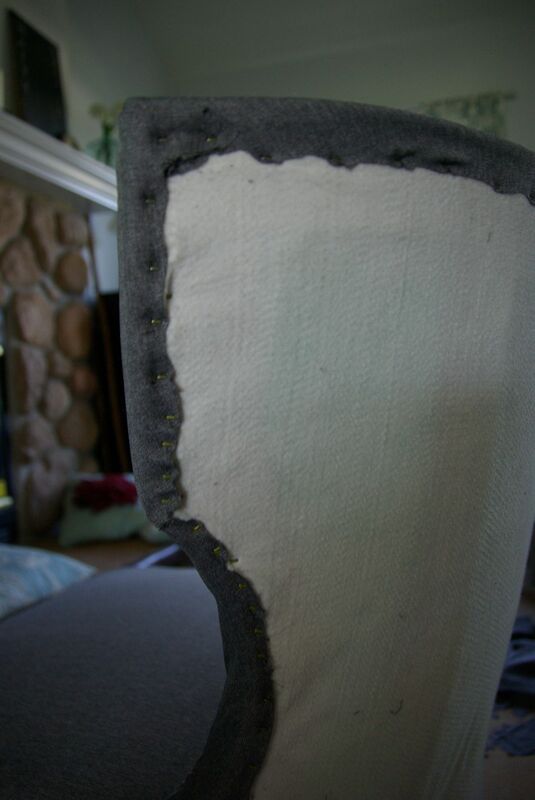 The next step was to make the cushion for the back of the chair. I placed the thinner cushion on the back. Cut around it. 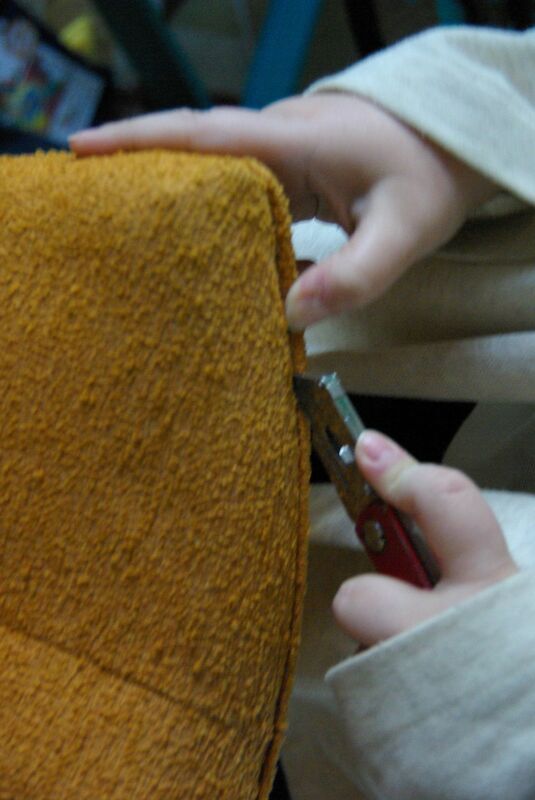 Being sure of the cuts and making the cushion fit into the groove of the chair back. 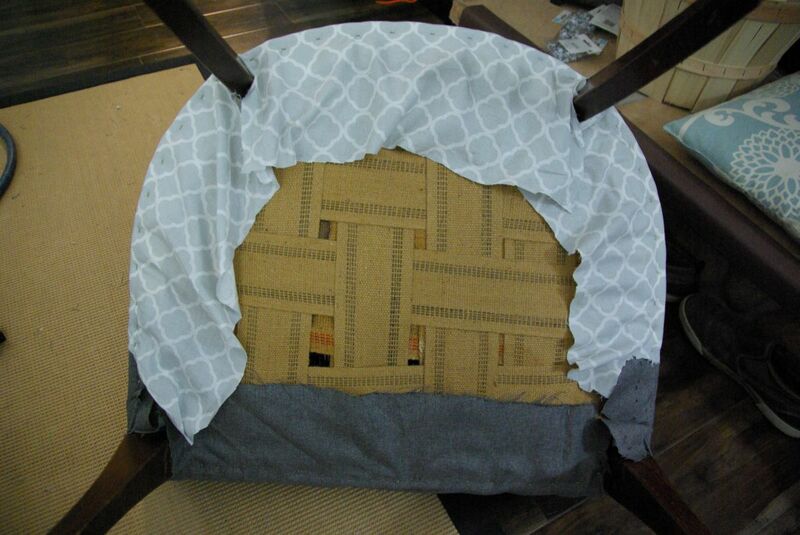 I lined the rest of the sides of the chair with the folded over quilt batting. Stapling it into place. 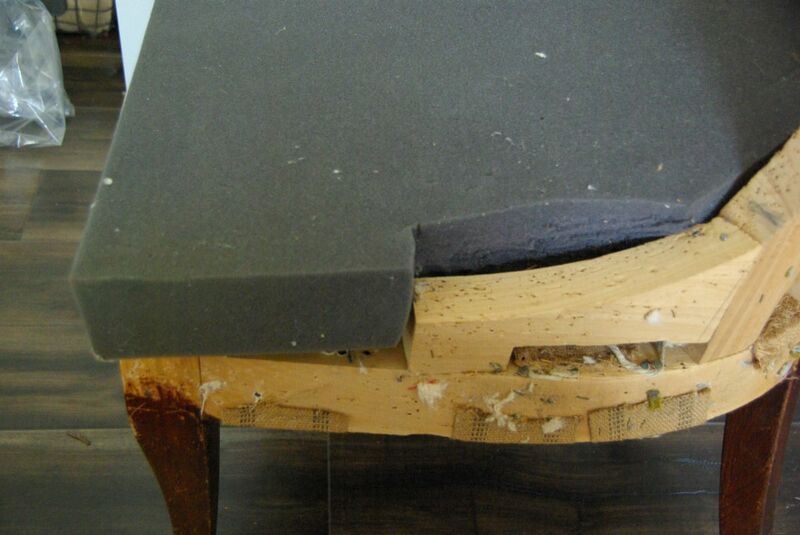 The back of the chair is broken up into three sections, with wood separating them. The middle section is the biggest, and the two sides are narrow and odd shaped. 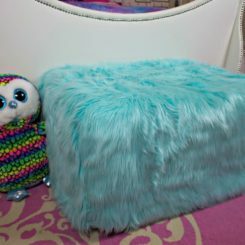 The middle section was easy to add the cushion to. 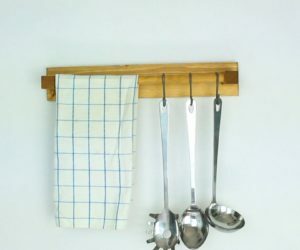 Simple cute were made to make it fit into place. 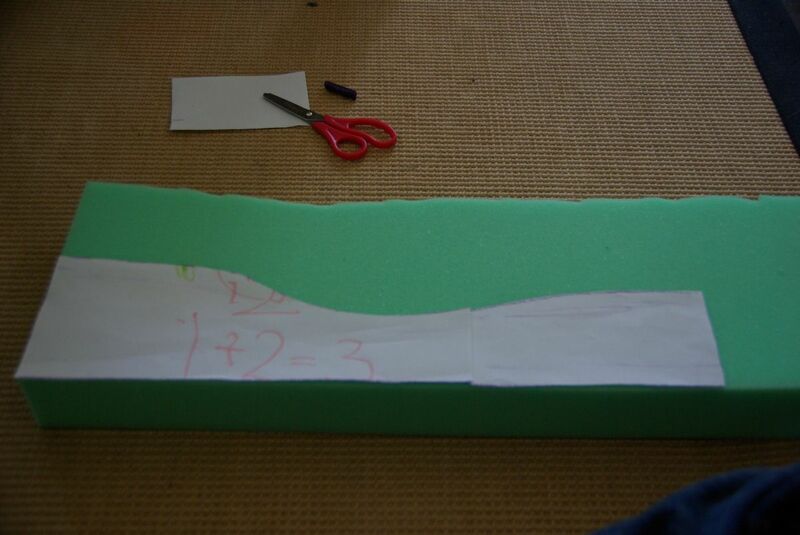 To get the shape for the sides correct with the cushion I set a piece of paper on the side and traced a template. 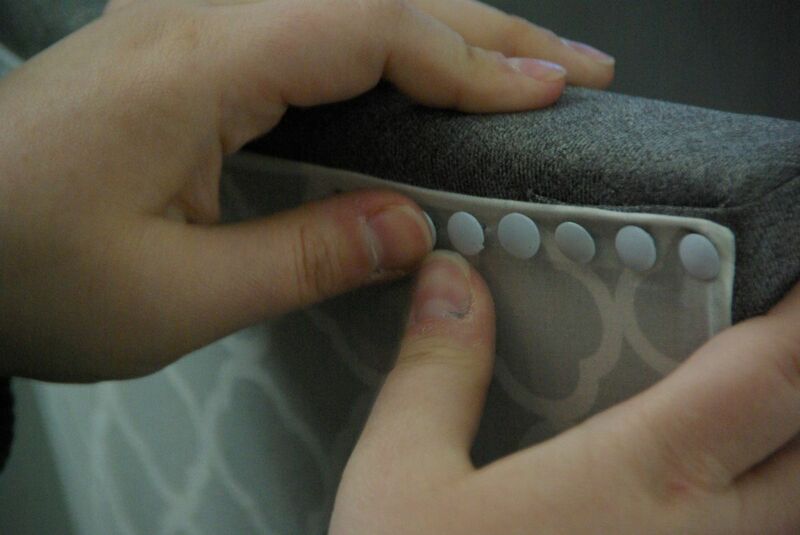 Set the template on the cushion. Used a razor blade and cut along the template into the cushion. I repeated on both sides and got both sides cut and fitted properly. The back cushions was wedged in almost perfectly. 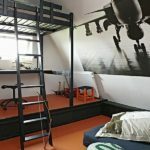 Which was needed in order to make the cushions stay in place. The plan was to make the cushions secure by adding the quilt batting over the cushions. 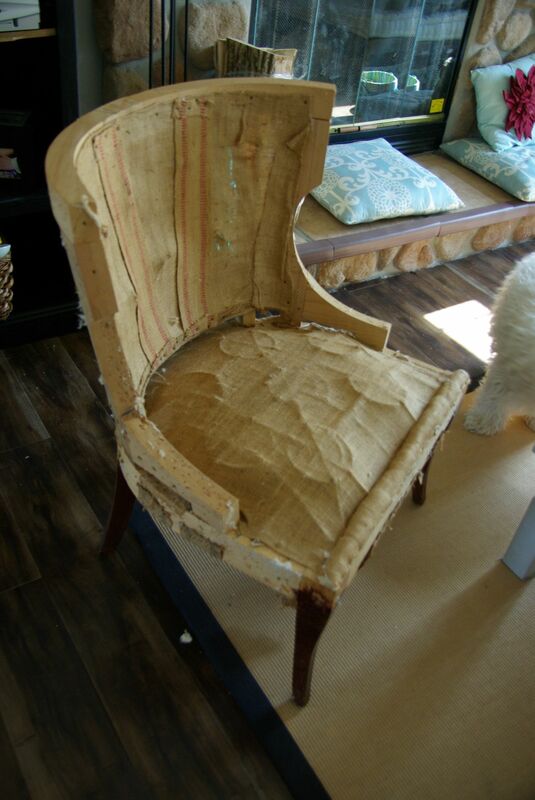 This will be pulled tightly and will hold the back cushions in place. To do this I attached the quilt batting to the top of the chair, leaving the long portion of the batting behind the chair. Which will eventually be used as the cushion support. I pulled it tightly and stapled the top and the bottom of the quilt batting. Now the whole chair was cushioned and secured. 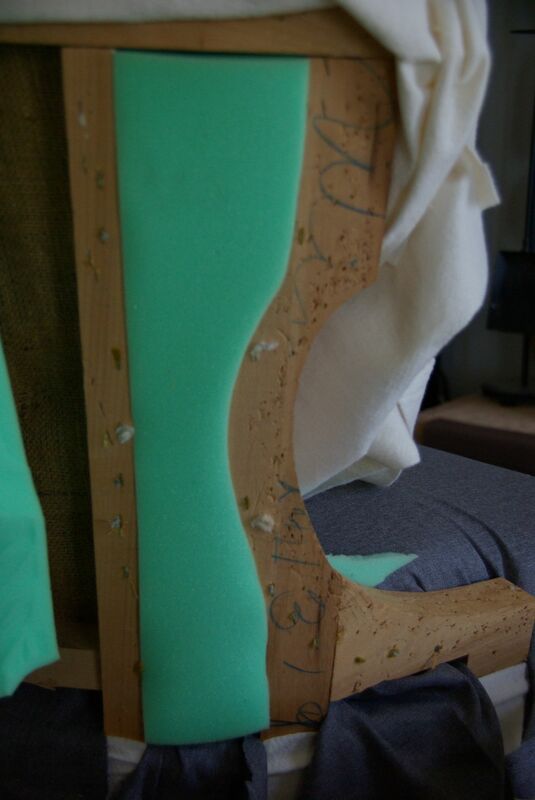 To move this along the next step was to add fabric to the front of the chair where your back sits on the chair. 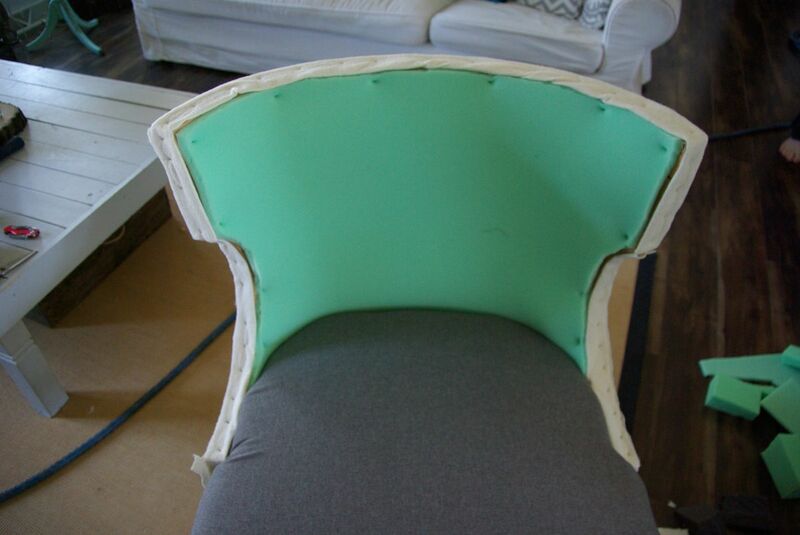 It was difficult because of the natural curve in the chair. 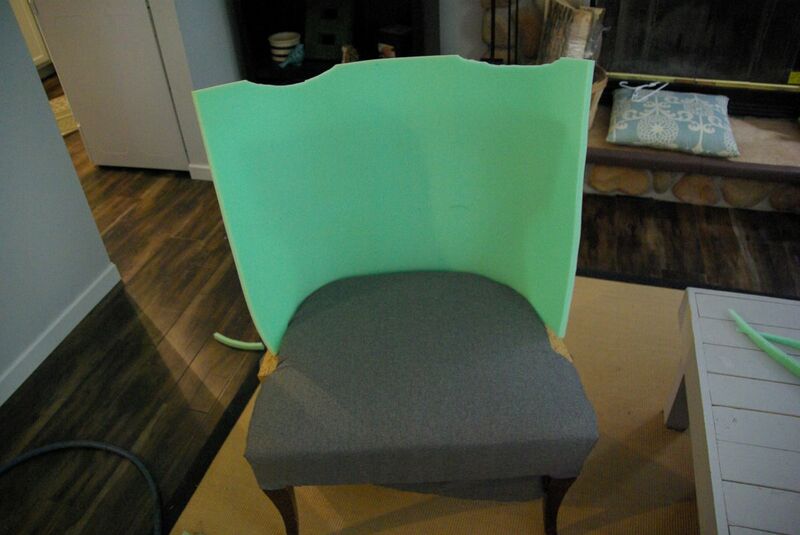 Before I tackled that headache I cut and stapled the the top portion of the fabric to the chair, all along the back and the upper portion of the side. To make the curve work with the material I tried a few different things. 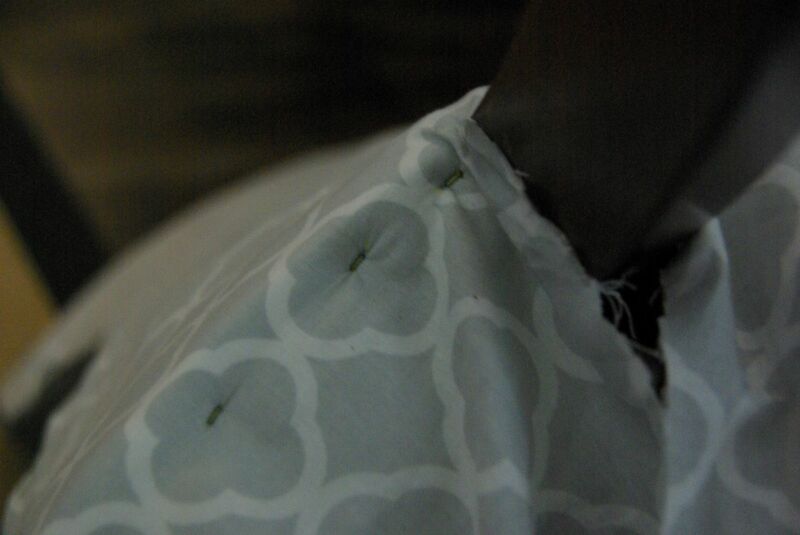 The one that I found worked the best was to cut slits in the fabric. I was then able to manipulate it and pull it tight in portions. 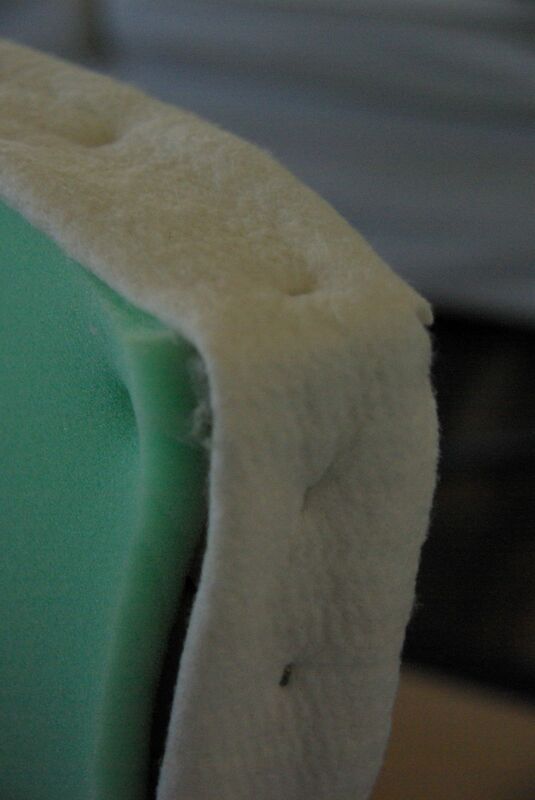 Allowing the material to wrap around the curve that way. 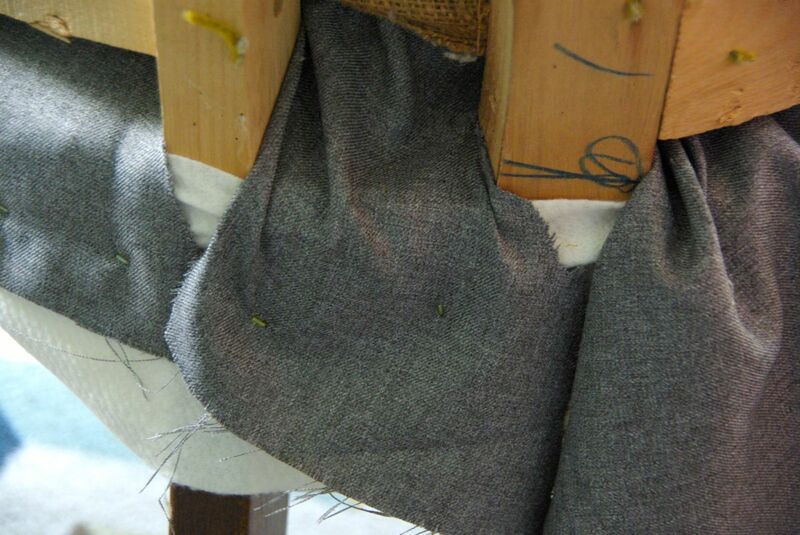 All of the fabric that was being pulled and stapled to the back will be covered by the light patterned gray fabric. So making the back of the chair neat right now is not a problem. The best advice I can give for the whole project is to pull it as tight as possible. 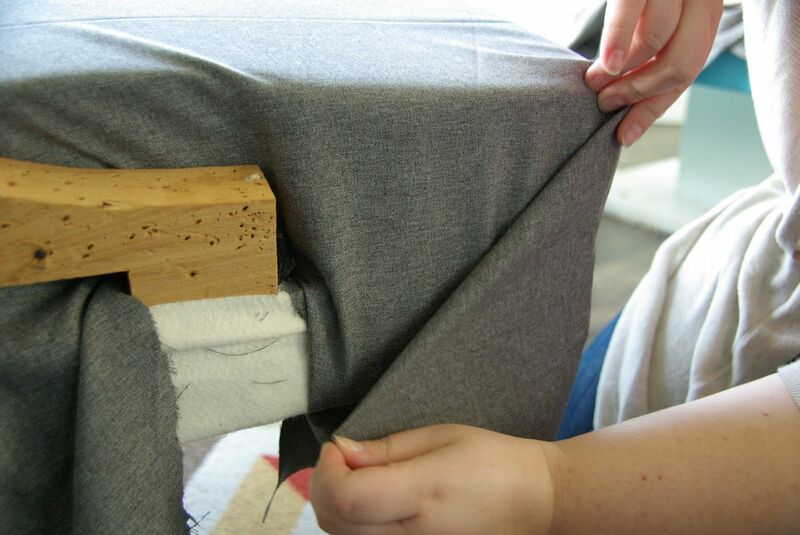 All of the fabric will naturally have a lot of give when being sat on so to minimize that the fabric needs to have the least amount of give as possible without ripping the fabric. I did not get a perfect curve, there is a bit of lines on the curve. 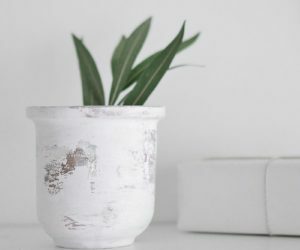 With this being a no sew one I expected some of the lines wold not be perfect. Once the fabric was fitted around the curve I cut the excess fabric, to help in minimizing any lines that might show through the back fabric. 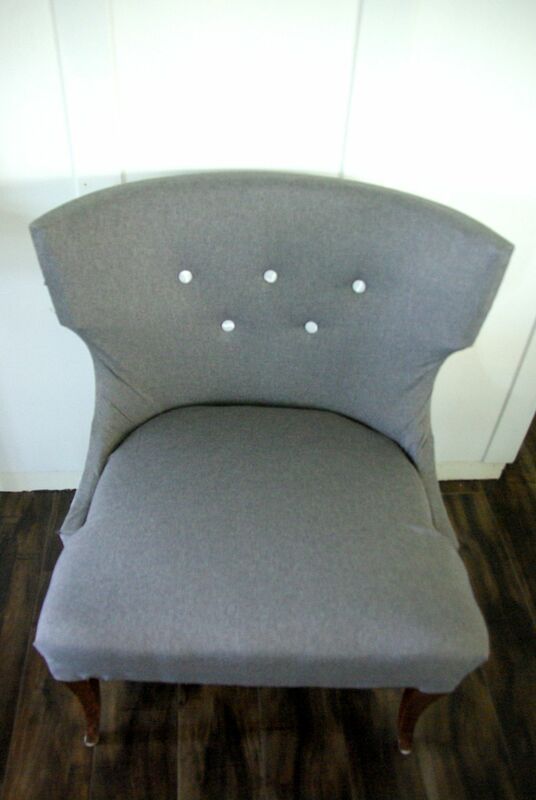 The front of the chair was done, but I needed to add the fabric buttons to the front which will add detail and break up the look of the front of the chair. 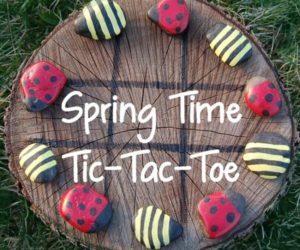 To do this I purchased fabric buttons, and cut portions of the light patterned fabric. I wrapped the buttons in the fabric, to make them pop against the dark gray fabric. 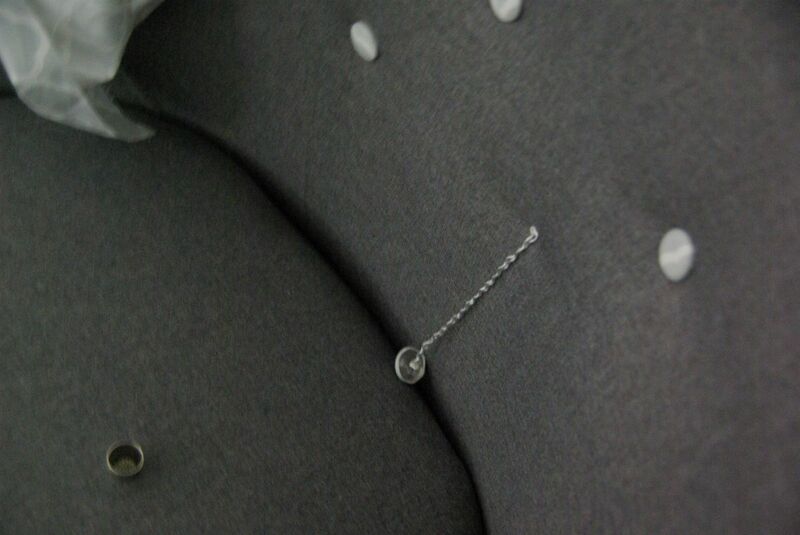 The back of the fabric buttons have a small loop in it. 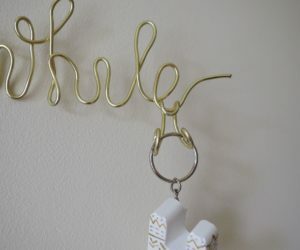 This loop is used to tie the string to the back and pull it through the fabric and secure it in the back. 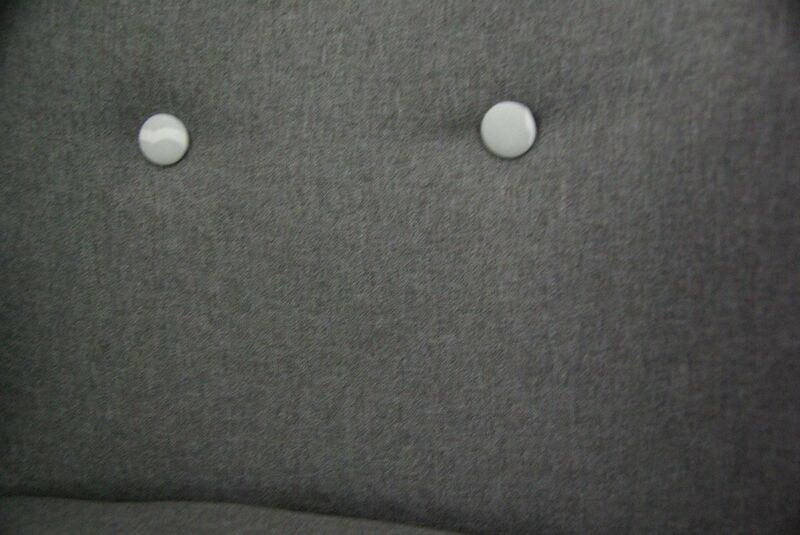 I marked where on the back seat portion of the chair I wanted the fabric button to go. Looped the string through the button. 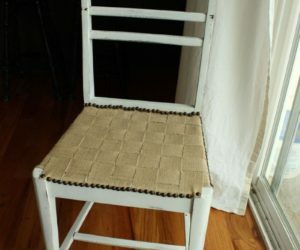 Then push the needle through the back of the chair, pulling all of the string with it. The button will be pulled up with the string. The buttons were on and the detail was added to the front. 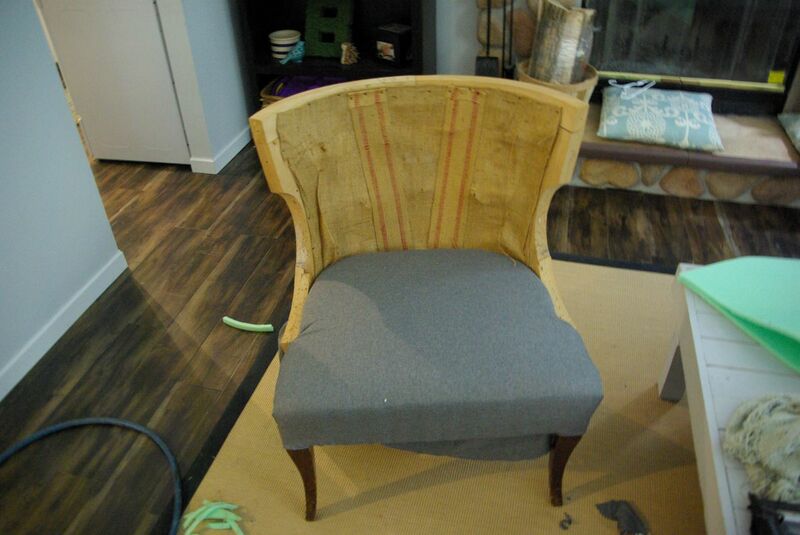 With the front of the chair fully done, I am able to add the back fabric to the chair. 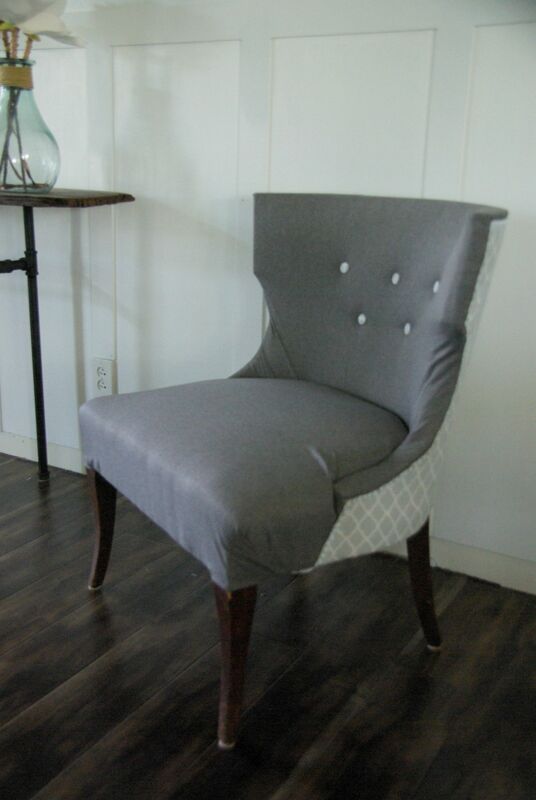 I did this by folding the light gray fabric along the top back of the chair. 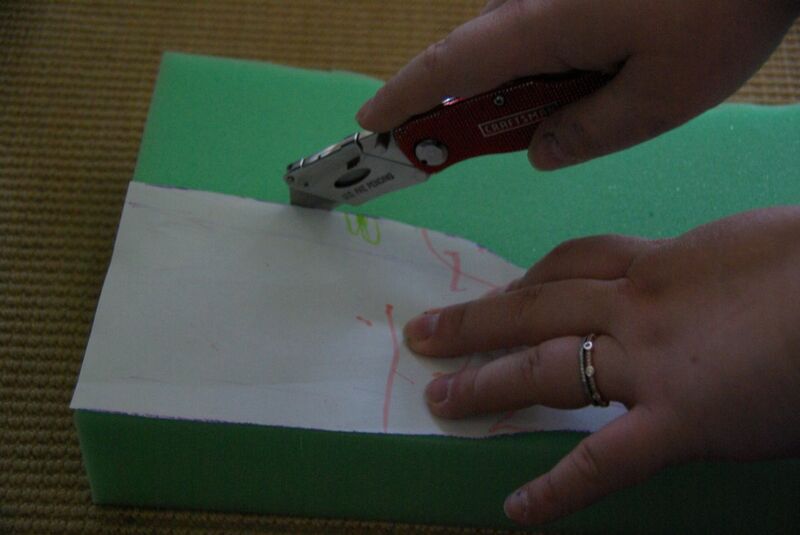 Stapling it along the seam where the staples of the dark fabric was pulled and secured to. I was getting so excited because I knew once this was secured I just had one more step until this chair is finished. 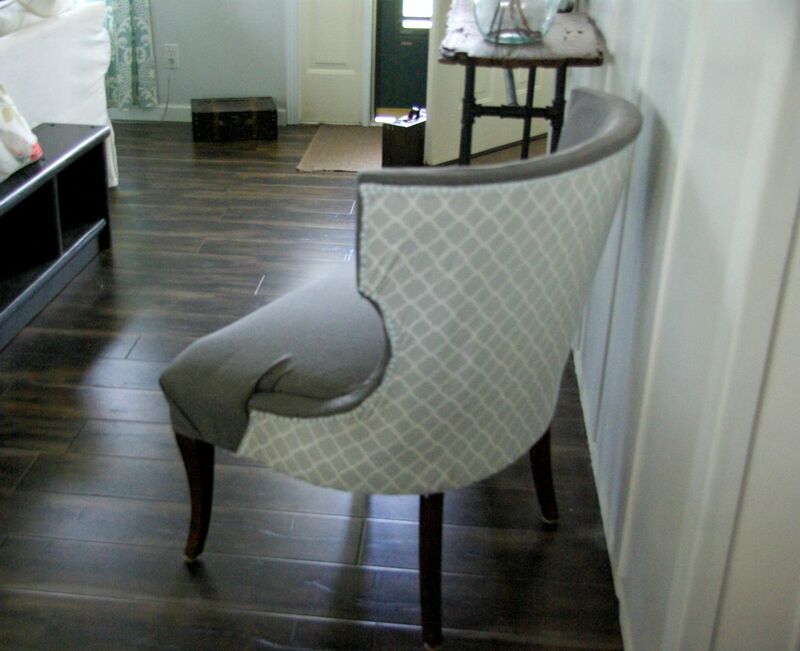 I cut the fabric and folded it along the back of the chair. Trying to keep the fold lines evenly hitting the chair. 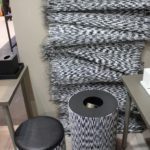 I wrapped the fabric under the chair. 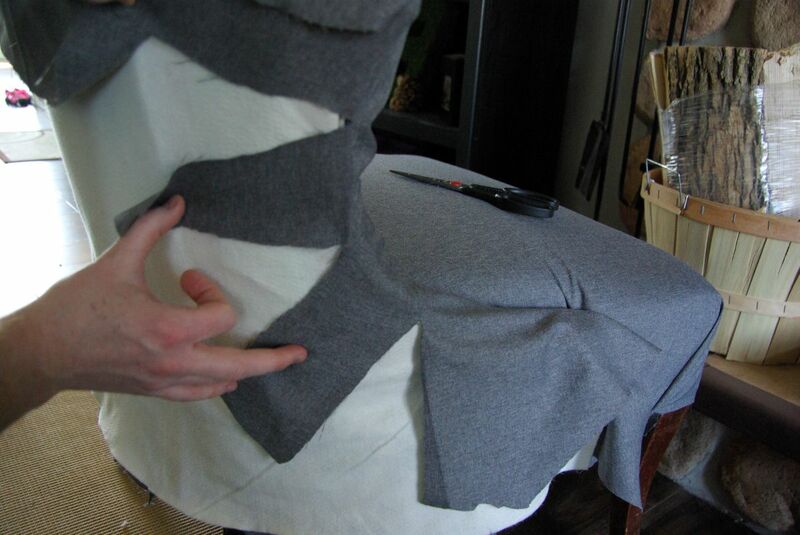 Cutting the fabric to fit around the legs of the chair. 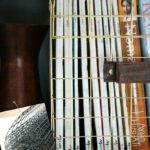 I needed a way to hide all of the staples, so I planned on using upholstery nails. 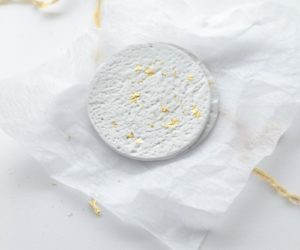 There are strips available to use, but they need to be sewed on. However, because of my personal challenge of not sewing this at all I am using individual nails for this. Pushing in the nails, one by one. 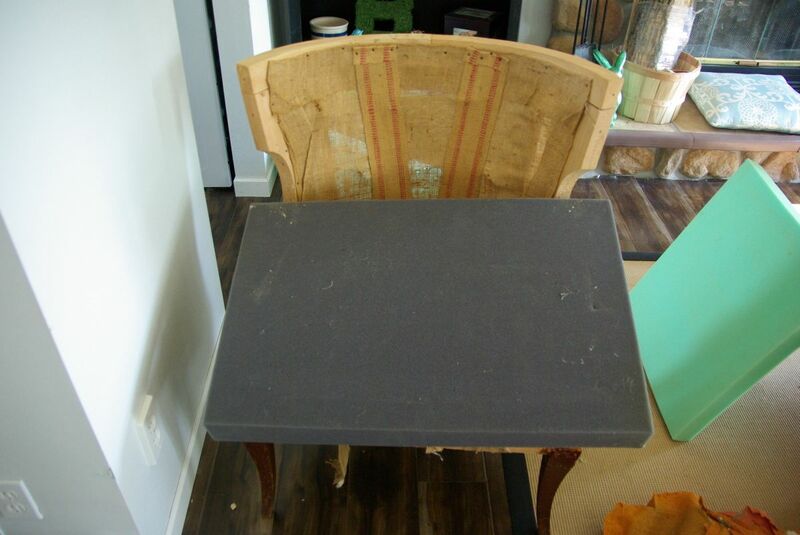 I was able to hide all of the staples and folds with the upholstery nails. 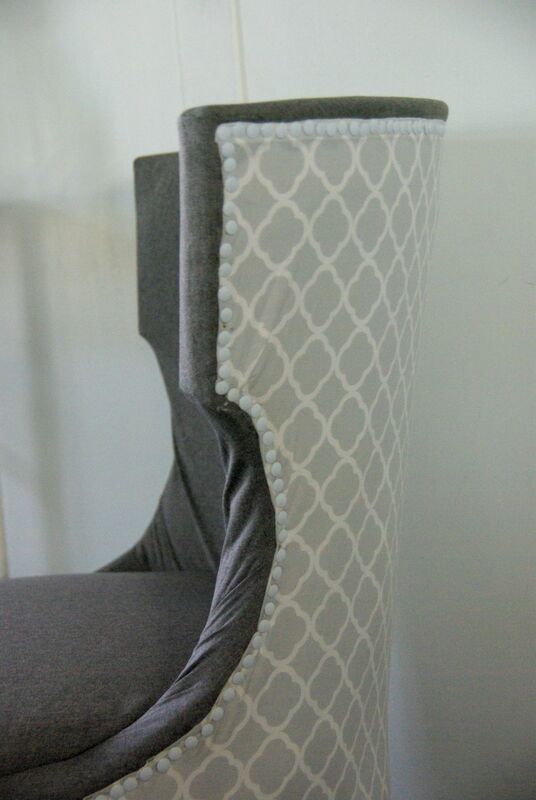 It adds a nice little detail to the chair, as well as hides all of the work and folding that went into it. I stood back once all was done, and was so excited. 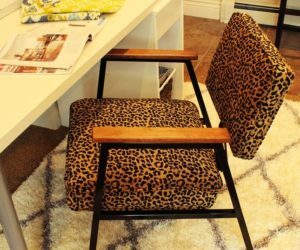 I accomplished a no sew full chair reupholster. There is a few portions of this that could have been better if I did sew it. 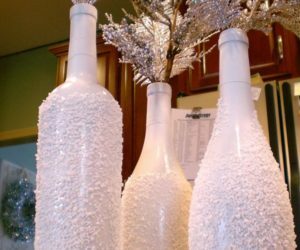 However, not everyone has the supplies or skills to sew things. The only supplies I needed for this was a heavy duty air stapler, scissors, and long staples. 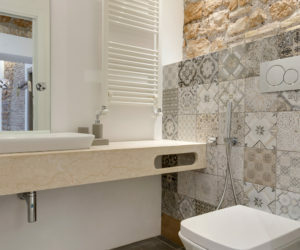 All things that most people have or can easily even rent from a home improvement store. The chair is nice and soft. 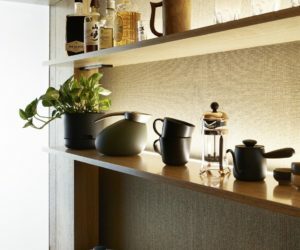 There is no hard spots or portions where the wood is felt. Adding all of the layers was needed and made this chair as comfy as possible. 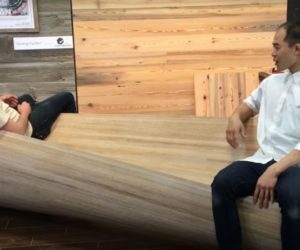 This chair had a lot of steps, a few headaches, and a lot of time. But, none of the steps were too complicated, and most was able to figured out by moving the fabric and trying things out. 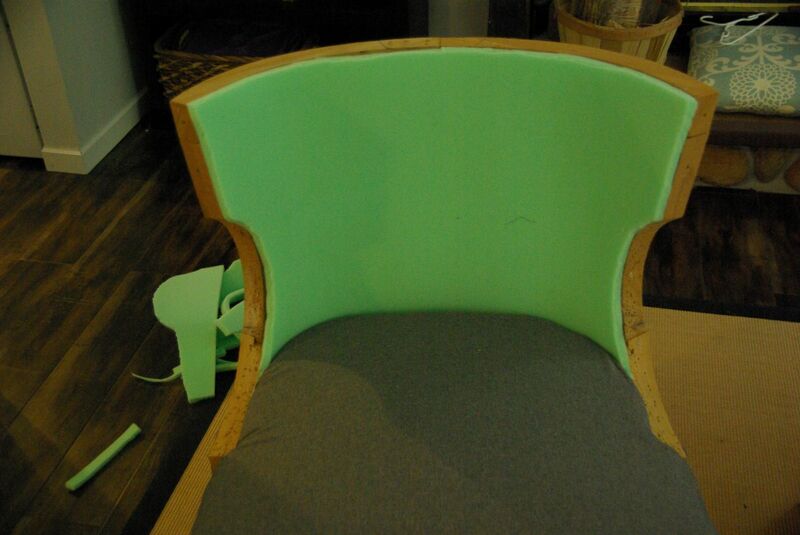 If I had chosen a chair without the curved edge it would have been a much simpler job. 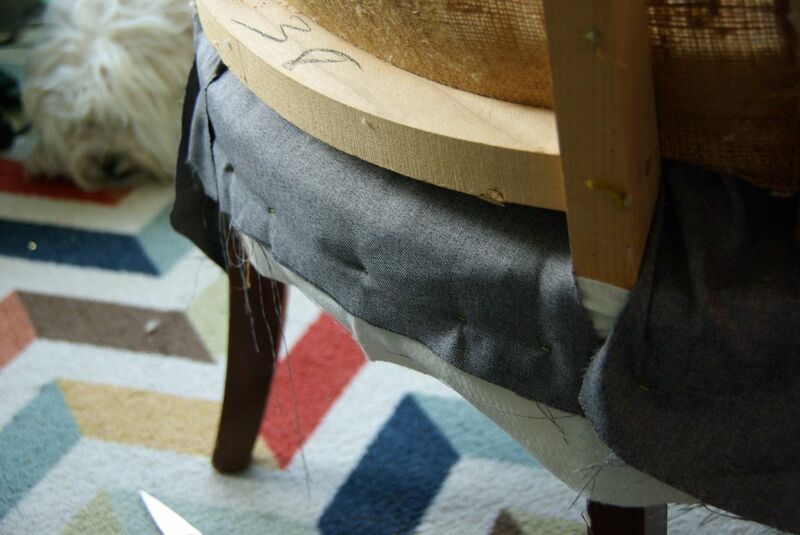 I think redoing this chair without sewing it makes a great up cycle. 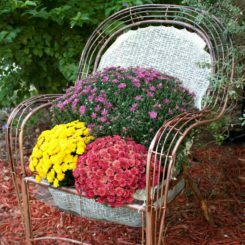 I have seen many chairs in yard sales or secondhand stores but have been deterred from buying them because of the pattern of the fabric. 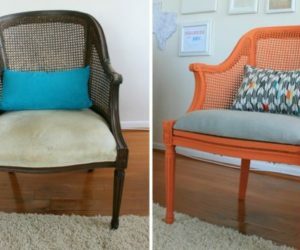 This way of doing it makes it possible for anyone to redo a chair that they like the bones of, but want to redo the look of it. 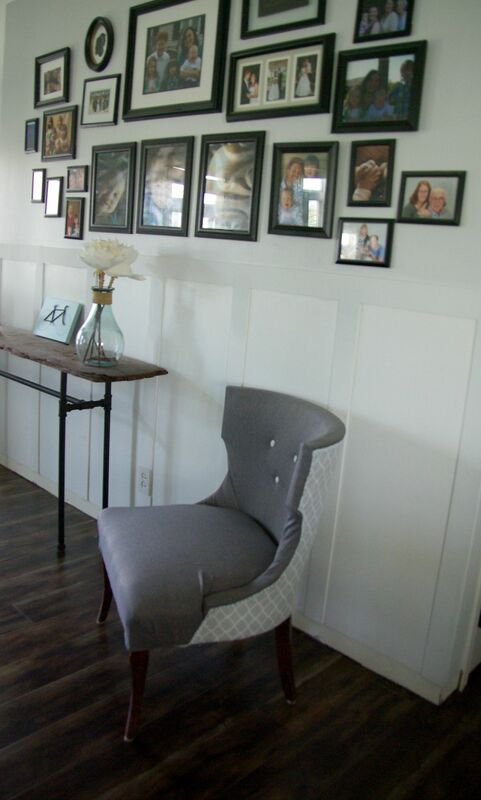 This is a great idea to modernize or change up the look of a room. 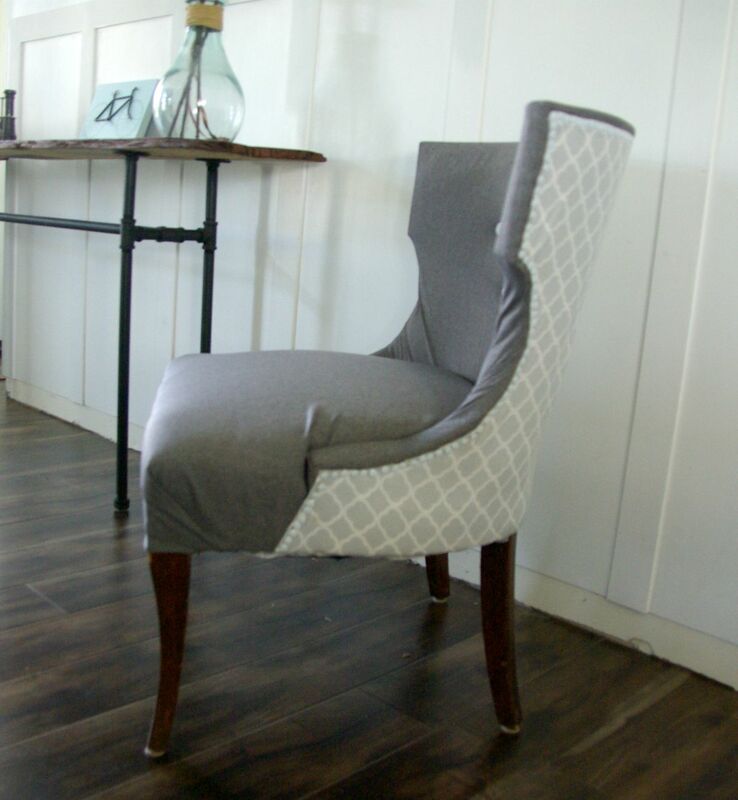 Having sewing skills is not needed to get the job done and have a beautiful chair that is both comfortable and stylish.